To assist Assessment Technology Incorporated (ATI) district and charter school partners in preparing students for statewide assessments incorporating new item types, ATI is continuing to expand our offering of technology-enhanced (TE) items. ATI is producing TE items for use in secure district-wide assessments as well as content for formative uses that can be included in instructional materials, quizzes and class tests to allow students and instructors to become familiar with these new item types. ATI TE item types include items modeled on SBAC and PARCC, state-released examples, and innovative designs from our professional staff of experienced item writers. Our writing staff has added 6,000 TE items to the bank and continues to add 400 items per month to promote student proficiency with these item types. ATI announces a new statewide approval for Galileo Pre-K Online in Florida. The Florida Department of Education Office of Early Learning has approved Galileo Pre-K Online as a pre- and post-assessment instrument for assessing children's school readiness. Programs in Florida along with those in Georgia, New York, North Carolina, and Pennsylvania where Galileo is also approved, have the opportunity to choose Galileo Pre-K Online for state-aligned assessment, curriculum, and school readiness. Galileo provides a data-driven, standards-aligned approach to the management of learning for children from infancy through age 5. Galileo provides early childhood educators and other stakeholders a complete and fully integrated curriculum, assessment, and reporting system that links assessment, planning, individualization and program progress. Galileo supports multi-method observational assessment including pre- and post-assessment of children with diverse characteristics including English language learners and children with disabilities. Galileo is backed by ATI’s ongoing research program including research designed to establish on a continuous basis the reliability, validity, and psychometric properties of Galileo assessment scales. Galileo’s English and Spanish scales provide reliable and valid information on child progress towards standards mastery and school readiness. ATI provides the following elements to support preschool programs as they make program management decisions, plan learning opportunities, and work towards the achievement of goals including those related to state initiatives. Experience in Standards-Based Assessment and Education: The Galileo G3 scales in English and Spanish are aligned with the Early Learning and Developmental Standards of most states across the country. These scales are comprised of comprehensive, empirically-based developmental sequences and have been developed and reviewed by experts nationwide. See Galileo G3 state alignments here. Measurement Expertise and Ongoing Research: Galileo is one of only a few early childhood assessment tools using Item Response Theory (IRT) techniques to provide a measure of progress towards standards mastery and school readiness. ATI’s expert staff has extensive experience conducting research to establish and update psychometric properties of assessment instruments as standards, instructional practices, and characteristics of the child population change. Support for Large-Scale Assessment Initiatives: Galileo interfaces are available to support automated data extraction for transfer to data warehouses and other systems that might be implemented as part of state initiatives. Customized forms can also be used to capture customized child and site data (e.g., program type, license status) to meet data aggregation and report filtering needs. Flexible Intuitive Reporting Tools and Immediate Information for Decision-Making and Planning: The Galileo Pre-K Online reporting system and the Online Reporter provide a variety of ready-made, standards-aligned reports that can be generated at several levels of interest as well as the capability to generate customized reports that can meet administration, program, and teacher needs. Unlike results from paper-and-pencil assessments, Galileo data is immediately available for reporting. Users can aggregate and disaggregate large amounts of up-to-the-second data in reports that prompt action by decision-makers from teachers to state department staff. Galileo promotes family engagement via the Parent Center providing access to information about child progress as well as at-home activities in English and Spanish. Comprehensive, Customized Professional Development and Training: ATI has a long history of providing excellent online and on-site professional development and training and has trained thousands of early childhood educators across the country. The web-based professional development tutorials offered by ATI enable teachers to reliably conduct observational assessments, record and report on the data, and use the results to provide appropriate learning opportunities. In addition, customized web-based professional development provided by ATI enables technical assistance staff, trainers, and administrators to serve as effective trainers and to conduct quality assurance and compliance reporting. To learn more about the tools Galileo Pre-K Online offers to enhance child learning, schedule an overview with a friendly and knowledgeable Field Services Coordinator. Galileo K-12 Online offers a full range of assessments with actionable reporting and school-comparison capability. The system includes benchmark, formative, screening and placement tests, interim and final-course examinations, pretests and posttests, technology enhanced early literacy and math assessment series, computerized adaptive tests, and instructional effectiveness assessments. Districts work collaboratively with ATI to create a comprehensive assessment plan that addresses District goals. For example, ATI works in partnership with districts in benchmark planning activities to design assessments that are aligned to district goals, local and state standards, state-wide testing blueprints, and district-adopted curriculum. These assessments are typically created using items from the ATI secure item banks that have established psychometric properties. ATI item banks include technology enhanced items resembling those provided by consortiums and others on state-wide assessments. The following uses the design of benchmark assessments as an illustration of the collaboration process as it relates to assessment plan design. Designing benchmark assessments to address specific District needs can be accomplished entirely using web-based interfaces included within Galileo K-12 Online. The process begins with using the Assessment Planner. District staff participates in the design of district assessments aligned to state standards and sequenced according to district curriculum and pacing guides. 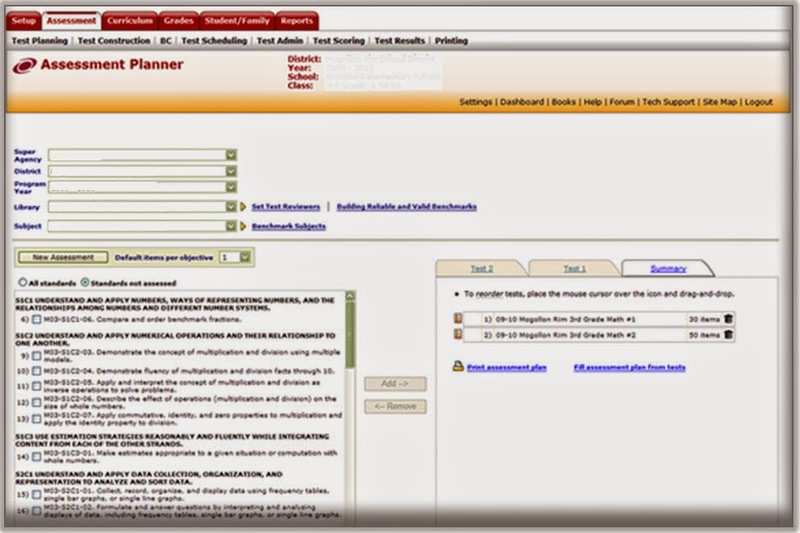 The Assessment Planner gives districts the option to determine how many benchmark assessments there will be during the year, when benchmark testing will occur, which standards will be covered in instruction and benchmark assessment, and how many items will be included for each standard on each benchmark assessment. ATI Educational Management Services staff works closely with district personnel during the benchmark design phase to ensure that the resulting benchmark assessments are of the highest possible quality. Once the design of a district’s Benchmark assessments has been finalized the ATI Educational Management Services team assembles tests to match the submitted plan. The ATI generated benchmark assessment matches the goals being measured at a variety of ability levels to give teachers the ability to measure student achievement and to identify areas that should be the focus of additional instruction. 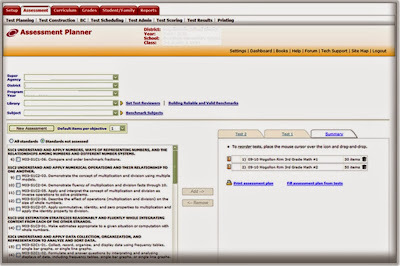 During the optional test review process, District reviewers can use item replacement tools to fine-tune the assessment. Each assessment includes a set of specific test instructions to teachers detailing how to administer the assessments. These directions are crafted to ensure that all students being evaluated on a particular item are provided with the same level of information and support in attempting the item. Following the completion of assessment review and after any requests or comments have been addressed, the tests are published to a secure library. The published tests are then easily accessible to district staff for scheduled test administration. To learn more about how ATI works with districts to plan assessments, schedule your Galileo overview, today. Reviewing the past year’s goals for Galileo-use and acknowledging successes and challenges. Special emphasis is placed on highlighting successes and the making of action plans to address challenges. Exploring ATI innovations and how these tie into new district initiatives. The planning process for next year including determining the testing calendar, the data importation schedule, and desired professional development. If you missed the webinar, the session was recorded and is now available on demand from the Professional Development Forum. If not already a Forum user, learn how to gain access to the Professional Development Forum by contacting ProfessionalDevelopment@ati-online.com.